By Haydn Bunton, June 1939. Whereever football followers and supporters frequent, the discussion invariably leads to some aspect or some player of our great national game. Often the trend of the discussion concerns a player or players or the question of who is, or was, the greatest player at some time or times. There is one avenue of discussion which opens up a very interesting argument, and possibly to which very little thought has been given. That is, who is the greatest football family in the history of the game? Speaking from the standpoint of view of our State history can anyone put forth a greater claim to this honour that the famous Doig family of Fremantle? Possibly, not only in this State, but throughout the Commonwealth. This name of the great football family has been connected with the game in this State for fourty years and two generations have in that period made its name in the annals of football history in this State. This family has gained it’s fame not only through the earlier generation, but also the present one. In the earlier generation there were four Doigs at the one time playing in the one club, and in the present generation there has been as many as five Doigs playing in the same team on the same day. It is also a noteworthy fact that every offspring of the older generation plays or has played football. This family has set up a wonderful tradition and it’s family history has been mostly interwoven with the great East Fremantle Club. Today we have the younger generation carrying on the great name of Doig in both East Fremantle and South Fremantle with credit and honour to the name of Doig, and each of them and to their club. 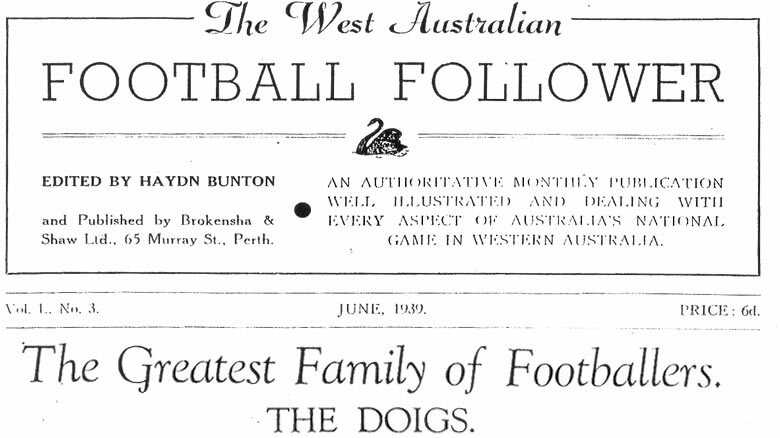 This Doig clan had it’s origin in Fremantle and there were five boys of the family. John (“Hooky”), James (“Scotty”), Charles, Norman and Cleave. We propose to set out their history, family and performances according to their prospective ages. Now John, commonly known as “Hooky” was the eldest of the family. Actually “Scotty” was the first to play with East Fremantle in the year they formed and Hooky joined the following season. Hooky immediately made his mark from the start. He became a famous back pocket player and is claimed to be one of the greatest back pocket players that has ever played the game. It is said that he could move on his hands and knees as fast as an average man on his feet. He only weighed in at ten stone seven (67kg) and there has never been a more vigorous yet fairer player ever taken the field. He was the most tenacious, combined with outstanding ability. Hooky Doig had many admirers in this day and no player attracted more interest and attention than this man. He played with East Fremantle from 1899 till 1913. This famous player was one of many of the flowers of Australian manhood that gave his life in France in defence of his country. His family name and tradition is carried by Norman, William and Edgar. Norman will be remembered as a brilliant back pocket player for East Fremantle for the last six years and is now in Victoria. It seems strange that this player should follow in his father’s footsteps so far as position on the field is concerned. Norman always appealed as an outstanding player for Old Easts and was always admired for his wonderful clearances from the back lin. Billie Doig will be remembered as a very promising wingman for Old Easts for about three seasons. This boy showed all the Doigs ability and in particular their determination. A most promising career was ended by an injury which prevented him from playing the game. Edgar was the lesser light and the youngest of the family. He was just beginning to carry on the family name on the field when his life was cut short with an unfortunate accident at his work. This boy showed great promise, but his opportunity was never fulfilled. James “Scotty” Doig was the next of the clan in age. Actually Scotty was the first to carry the name of Doig on to the football field. Scotty was the biggest of the family, being about 5ft. 11in. and weighing about eleven and a half stone (73kg). He joined up with East Fremantle when the club was first formed in 1898. Scotty occupied the important position of centre half back, and what a great footballer. Whilst Hooky was noted for his ground play, he was noted for his brilliant high marking. In addition he was a dashing player and revelled in the hard going. Scotty held the position of centre half back for Old Easts from 1898 till 1911. He represented the State in the first team that was ever sent East from Western Australia. That was in 1904. Scotty is still hale and hearty and residing in Fremantle, and still follows our great game. It is a noteworthy event to chronicle here that one of Scotty’s daughters is married to the well known and popular Johnny Bowe, a Subiaco and State player. Scotty’s descendants that have carried on the football name of the Doig family are Jimmie, Ronnie and Dave. The football history of these three boys is associated with South Fremantle. This was not a matter of choice but rendered essential on account of district football. Jimmie was the eldest of the family and for some years was a brilliant rover for South Fremantle. He played with that club for about nine years. Ronnie Doig promised to be one of the State’s greatest half forwards. He was about the biggest of the whole clan. What a magnificant physique he possessed and his movements on the field were beautiful to watch. Ron Doig has been noted as one of the youngest players to ever captain and coach a team. He was the inspiration to his side, not only with his leadership but with his wonderful ability. This magnificant career was also cut short by his untimely death. Ron represented this State at football and also at cricket. His sporting ability, personality and popularity will long live and a striking tribute to these stirling qualities has been shown by his friends and admirers erecting a ward to his memory at the Fremantle Hospital. The youngest member of the family, Dave, is now a very prominent and dashing half-back for Souths and promises to develop into one of the State’s best half back men. He is slightly taller that the average members of his family. This player won his State colours against St Kilda last year. Next we have Charles Doig, the most famous of the Doig family. He merits this position in the clan for his ability, not only on the field, but also on the administration side of football. Charles Doig joined up with East Fremantle in 1903 and became famous with that club as a half forward and then later as a full forward. Charlie was noted for his all round ability so far as marking, pace and position play was concerned and was a particularly deadly shot for goal. He was famous for his place kicking and at this he had no peer in the game. He represented this State at the Jubilee Carnival in 1908 and in the 1911 Carnival in Adelaide and in the 1914 Carnival in Sydney. The fact of representing a State in three carnivals speaks volumes for his ability. On his retirement from the game he concentrated his activities on the administration of the affairs of the Old East firstly on the committee and then in the position of president of the club. This position he occupied for 13 years which is a record for the club and for that matter I think any other club. He has filled that position with honour and credit to his club and to himself. Charlie and his late wife have always been leading lights on the social side of East Fremantle Club. It is chronicled that up to the time of the death of his late wife he had not missed a social or dance of his club for thirty years. Charlie’s representatives on the football field today are his sons Charles and George. Both of these players have become two of Old Easts leading players. Charlie is the utility man for his side and can be played in any position. He is not a very big or robust type of man, but there is no player in the game today that shows less fear and more determination than young Charlie. He is a very dashing player with tons of ability and brains. George Doig follows in his father’s footsteps as a famous forward. He has proved one of the foremost full forwards in the game in this State. He has been a prolific goal kicker and can claim several records. Notable amongst these records are firstly, he has kicked the highest number of goals in one season. This is an Australian as well as a State record. Secondly, for six consecutive years he has topped the hundred mark in each year, and thirdly has the record for this State for the highest number of goals kicked in one match. So George is certainly upholding the tradition. George Doig is not a very big player. He is an excellent mark, a sure kick and a very brainy player. Like his brother, Charlie, he is, using a well-known saying, “as game as Ned Kelly”. George has represented his State on numerous occasions and was a player in the 1937 carnival team. The fourth member of this famous family is Norman Doig. He joined up with Old Easts in 1906, and played until 1909. Norman did not rise to the heights of his older brothers, but was always acclaimed as a brilliant winger. Norman still works and lives in Fremantle, and follows his old club. In his family he has two boys playing junior football, but they are not yet old enough to take their places with Old Easts. Their careers are being watched with interest, and there is no doubt as time advances from the promise they now show that they will carry on the Doig tradition. The last, but not least of the clan, and the youngest is Cleve Doig, erstwhile president of South Fremantle. Cleve commenced his League career with Old Easts in 1912. He was stationed on the half back wing. He played with Easts in 1912, 1913 and 1914, when he transfered to Souths. Cleve was considered as one of the most dashing wing half backs of his day. His promising career was cut short by his enlisting and going on active service. On his return he again linked up with South and has been a staunch and ardent worker for that club. He was president of Souths for three or four years and only relinquished that position on account of ill health. Cleve is still an ardent follower of South, and the game generally. His branch of the family is represented by one son who as yet is too young to take the field. There is no doubt he will be another champion. And this is not the last we will hear of this great football family. Generation after generation will rise and must succeed as these Doigs come from hard and true steel and ring true. We bring to a conclusion the story of a great family not only as footballers but as men and citizens. Can any reader tell us of a more famous football family?